The Andrew Edlin Gallery is excited to announce a retrospective of drawings by Victor Moscoso, one of the pre-eminent graphic artists of the 20th century, and widely renowned for his 1960s psychedelic posters and comics. The gallery will publish a 96-page catalog to accompany the exhibition. This exhibition is the first to present the full range of Moscoso’s drawings for posters and comics, including original renderings for his renowned cover of Zap Comix #4 (1969), the Hocus Pocus story, posters for The Doors and The Who, and other seminal published editions. These works, executed as production art for printed pieces, reveal Moscoso’s dedication to expert draftsmanship in the service of graphics, as well as a sure and graceful approach to drawing everything from dinosaurs to spaceships to humans. Victor Moscoso’s impact on the visual culture of the psychedelic era belies his modernist training (he studied with Josef Albers at Yale in the late 1950s), which he used to delineate images, posters and comics that explore geometric space, animation, and cartoon icons. 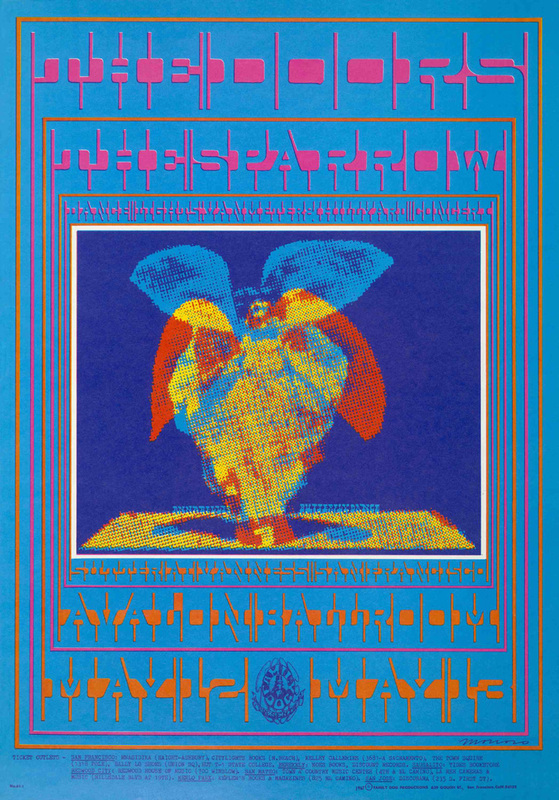 In 1966, while living in San Francisco, Moscoso began designing posters for rock shows in the city, and by 1967 had developed his signature style, in which opposite hues of the same intensity sit next to each other to create a visual “vibration” effect and lettering is designed for its form instead of function. Moscoso’s lettering was all hand-drawn; his approach to letterforms gave negative space as much weight as the positive. This spatial confusion, along with color vibrations and Moscoso’s mysterious imagery, made his work instantly recognizable. Between 1967 and 1970, Moscoso designed over one hundred posters for everyone from the Grateful Dead to Jimi Hendrix to Allen Ginsberg. 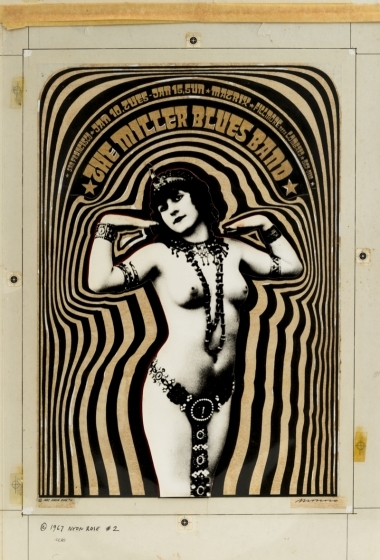 In doing so, he revolutionized the worlds of graphic design, typography, and rock ‘n’ roll imagery. In 1968, Moscoso was invited by Robert Crumb to join him in Zap Comix. Moscoso’s abstract and lyrical comics debuted in issue 2 and he has remained a driving force of the Zap collective through to its final iteration, a 2014 “Complete Zap Comix” box set that sold out immediately upon its release. Victor Moscoso was born in La Coruña, Spain in 1936, and moved to Brooklyn in 1940. He attended the New York High School of Industrial Art and then Cooper Union and Yale University, where he earned a BA in 1959. He completed a master’s degree at the San Francisco Art Institute in 1961. Moscoso, who resides in Marin County, California, has also completed album covers, billboards, animations and posters for artists including Jerry Garcia, Primus, Herbie Hancock, The Who and many others. His work is in the permanent collections of the Museum of Modern Art (New York), The Cooper Hewitt Smithsonian Design Museum (New York), the Victoria and Albert Museum (London), The Brooklyn Museum of Art, the Library of Congress (Wash DC), the San Francisco Museum of Modern Art, The Louvre (Paris), the Whitney Museum of American Art (New York), and the Tate Modern (London). Norman Hathaway is a graphic designer, design historian, and lecturer. He is the author of Overspray: Riding High with the Kings of California Airbrush Art and co-author (with Dan Nadel) of Electrical Banana: Masters of Psychedelic Art and Dorothy and Otis: Designing the American Dream. Dan Nadel is a writer and curator whose most recent exhibition What Nerve: Alternative Figures in American Art, 1960 to the Present was presented at the RISD Museum in Providence, RI. He is the author of books including Art Out of Time: Unknown Comics Visionaries and co-author (with Norman Hathaway) of Electrical Banana: Masters of Psychedelic Art and Dorothy and Otis: Designing the American Dream. Loved this guys stuff !!! Ross Harmon liked this on Facebook. Cynthia Merwarth DeBari liked this on Facebook. Peter Volckens liked this on Facebook. Michael Emge liked this on Facebook. Rick Ruiz liked this on Facebook. C.B. Archibald liked this on Facebook. Gary Martin liked this on Facebook. Lee Jamison liked this on Facebook. Glen Trosch liked this on Facebook. Peter Leitch liked this on Facebook. Rich La Bonte liked this on Facebook. Hiroshi Makise liked this on Facebook. James Ricks liked this on Facebook. Jan Mortensen liked this on Facebook. Marc Beck liked this on Facebook. Dennis Pfeifer liked this on Facebook. Peter Colpack liked this on Facebook. Nick Reed liked this on Facebook. Thanks for letting me know about this. Definitely attending ! Lilian Ek Saho liked this on Facebook. Ryan Hyman liked this on Facebook. Ami Ishimatsu liked this on Facebook. Christopher Davis liked this on Facebook. Toshiya Oki liked this on Facebook. Tom Stein liked this on Facebook. Joel Weinberg liked this on Facebook. Thiago Quintella de Mattos liked this on Facebook. Laurence John McKenna liked this on Facebook. Mitch Launer liked this on Facebook. Jason Hibberd liked this on Facebook. Rilene Ann liked this on Facebook.